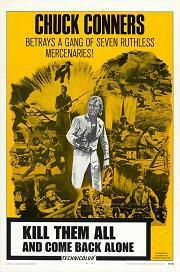 Civil War Southerner Clyde Mac Kay (Chuck Connors) recruits an expert knife thrower, a strongman, a dynamite expert and an ambitious young follower to accompany him on a daring mission to raid a Union fort. Once the firing starts, who's going to be left alive...and who's going to their ultimate reward? Also with Frank Wolff and Alberto Dell'Acqu.